BPW’s class leading trailer suspension systems provide cost effective, safe and reliable solutions for trailer manufacturers and operators. Whether you require air or spring suspensions or a swivel axle bogie, we aim to provide the complete package from one source – BPW TRANSPORT EFFICIENCY LTD.
BPW's comprehensive range of trailer air suspensions are designed to perform under various operating conditions, from low tare weight configurations for highway applications to heavy-duty on/off-road models up to 14 tonne per axle capacity. 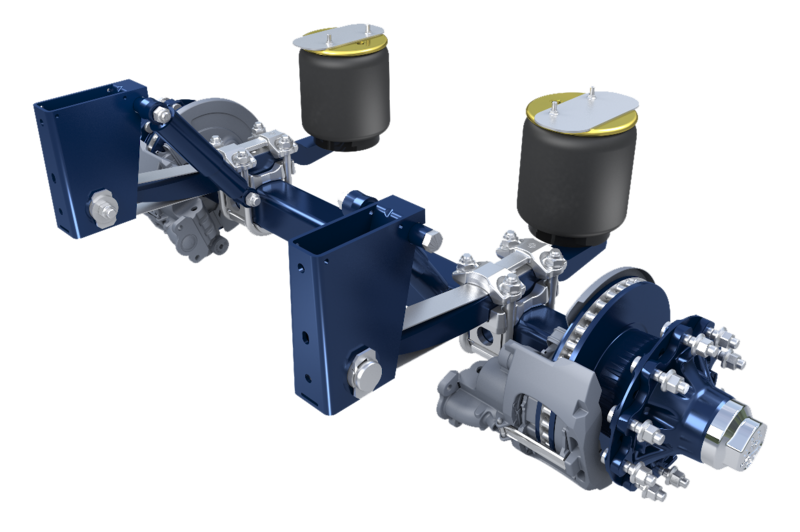 BPW's air suspension using the new clamped axle connection offers weight optimisation for bigger payloads, easy installation and track setting of the axles using adjustable hanger brackets. BPW suspension systems rely on proven technology and can be used with either disc brake or drum brake and offer many advantages in terms of comfort, economy and safety.